It has been a while since the last review on DavidNews.com. It seems like there is a short spring break in the HYIP world. However, we have a new rival – FexFund. It’s a program, which joined DavidNews.com Sticky Listing on 29th of April and has been already online for 5 days. Now, it looks like a blank page of paper like many other programs at the very beginning. However, I have reinvested in it $360 to keep an eye on the performance of the program. Let’s look what’s behind the blank page. Those who have read my previous reviews might have already noticed that I’m grateful to every website owner, who has thought about user. In fact, it doesn't matter if it’s a HYIP or e-commerce website. At first glance, the FexFund website looks very good with a well-thought tagline, providing answer to what the HYIP is about and clear call to action. Most importantly all these elements are displayed on the home page and can be seen without scrolling down to the bottom of the page. In terms of content structure and layout, this is a very good example. Most likely the FexFund admins has ordered or made himself a custom script and design for this website. In fact, I found one small error on the mobile device, which can’t be seen on the desktop. The website is responsive and looks great on mobile devices, but on the home page, there is one content block, which is not responsive and has no borders. Therefore, mobile users will not be able to read the paragraph explaining what is FexFund (company bio). Right after the main block of the home page, you can find an investment plan calculator. I will talk a little bit later about FexFund investment plans, but I want to mention it now because the calculator is very handy for the first-time visitor. Of course, relevant only for those who are interested in the investment plans. However, there is a space for improvement of the FexFund calculator. The user might want to enter the amount of investment and try changing the plans, to understand the benefit of each plan. However, desired amount of deposit is changed to min. deposit of each plan right after you try to change plans. Of course, it’s not a big deal to type the desired amount of deposit again, but it would be more convenient. In terms of homework, FexFund has provided company registration details. Name of the company published on the website is matching the name in the Companies House register. Registered office address on the publicly available register is different from the address published on the FexFund website. However, company name and registration numbers are matching. Moreover, the admin has indicated on the website that a location for the United States of America will be coming soon… Probably, it will provide extra credibility for some people. However, I don’t see any difference if the HYIP has two or three locations. It’s still a HYIP, right? In fact, who will try to check the address in the real life!? However, if you are in the UK and decide to check FexFund company address, drop us a message on the chat box and let us know if you met anyone. Luckily, the FexFund admin has chosen 3 plan approach, which is easier to understand. In my opinion, people hate when there are too many options out there and I believe it applies to investment plans as well. 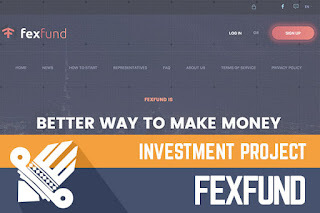 FexFund accepts deposits starting from as low as $10 and up to $50 000. Deposit is either included in daily payments or returned after 7 days. As usually, I’m interested only in daily profit, to understand the real potential benefits of each plan. For example, $200 deposit in the second plan called FEXFUND with 6% a day would make $12 a day and reach the break-even point after 17 days. The investment cycle is 20 days and after 20 days $200 investment would have made $40. Of course, only in case, it’s not another project with short term goals. Unfortunately, only the admin of this project knows it. However, you can check out more information about the investment plans on their home page. Moreover, drop a message in a chat box in case you notice anything unusual about FexFund. To sum up everything, it still seems to me like many other HYIP’s out there - a blank page, which can become any color in minutes, hours, or days. Right now, we have a program FexFund with a quality website and well-structured content on it. There was a small issue on mobile devices, but among other websites, it still looks much better than the average. I didn’t notice anything else worth mentioning. Therefore, only time will show what’s going to happen with FexFund. Name of the program remains a mystery to me and I didn’t find an explanation for it on the website of this program. It could be an abbreviation for First European Exchange or short version of Forex. Nobody knows… No matter if you are a beginner or an expert, remember that all HYIP’s are highly risky and you are the only person responsible for your investments. Therefore, if you ever decide to make any investments, don’t invest more than you can afford to lose! Investment plans: 5% up to 6% daily for 20 up to 30 calendar days, initial deposit included in the payments. 109% after 7 calendar days, inial deposit included in the payment.